World renowned Light load Towels are the only beach towels that fit in your pocket. All our towels are survival tools. Use them for so much including a firestarter, face mask, insulation,diaper and more. The towels are soft against the skin and washable. Great for packing in small places and excellent for shedding weight. Keep one in your glove compartment, your camping gear, swimming gear, first aid kit etc… Never be left without one – they will come in so handy. I wanted to review this compact beach towel for when we begin camping. 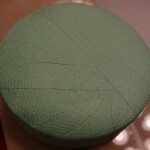 I haven’t expanded it yet but the size is about the size of a mint tin but thicker. It is 4.5 ounces and when we are ready to use it – we will simply add water to expand it. I will have a towel for emergency situations, a beach need, survival help and more. I can’t tell you how many times we have been in situations where we have needed a towel, tablecloth, blanket or something and been without one. The towel is 36 x 60 inches ($59.99 for a 12 pack) but they also have 12 x 12 inch towel packs ($25.99 for 50) and 12 x 24 towels ($49.95 for 50). Have you ever been in your car, in the garage, on a hike, or at your favorite swimming hole and suddenly realized you could use a towel or at least something absorbent? 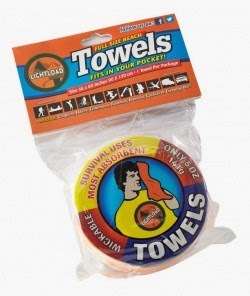 Light Load towels are a great product to keep in your car in the emergency kit, or in your first aid kit, as well as take camping, to the beach or swimming hole, take it with you when you go fishing or where ever…. Just add water and watch it unravel. Let it dry and you have a very versatile towel that can be used again and again. I like to keep mine in my travel bag, it’s compact and I know that if I become in need of a towel Or one of the many things listed below, it will be there and ready to use.. It would be great to have several of these around for Justin in case. I know my Fiancé needs to keep one on him at all times. World renowned Light Load Towels are the only beach towels that fit in your pocket. All of these towels are survival tools. 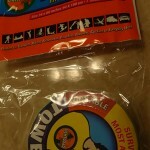 Use them for so many things including a fire starter, face mask, insulation, diaper, beach towel, hand towel and more. The towels are soft against the skin and washable. Great for packing in small places like your glove box, fishing tackle box, trunk, first aid (or survival) kit or backpack / dufflebag. Information about the Lightload Towels Company. Finally just this past year “Wideload” hiked the 270-mile Long Trail in Vermont from the Canadian border to the Mass-Vermont border. It’s the oldest long distance hiking trail and was conceived on Stratton Mountain, Vermont the same place that the Appalachian Trail was given birth to some years later. This also was very magical and he hopes one day to redo the adventure. He also spent about eight years living in Asia. There he had the opportunity to lead hikes in Taiwan and do hikes in Nepal, Pakistan and China. During this time he learned how to speak Chinese. Another fondness he has is camping. He has spent time in many of America’s national forests including the Ochoco (Oregon), Davy Crockett (Texas), San Francisco (New Mexico), Willamette (Oregon), Piedmont (Alabama), Desoto (Mississippi), Allegheny (Pennsylvania) Green Mountain (Vermont) and many others. I had the chance to check out the Lightload Towel. I thought this is an interesting towel when it came in the mail. I had to open it to see what it was all about. Okay, so this towel can fit in your back pocket. You open the package and it is in a little round like hockey ball. I pull it open into a full-sized towel. Then I see you can use this towel for many purposes. If you are on a trip or camping, you can use it to wipe off sweat from your face or clean up a mess. You can use it in the garage to clean your hands or most anything. The towel is inexpensive and it is pretty tough. I started gardening and this towel would be great to put on the ground, so I keep my knees from getting bruised or cut on the ground. I am impressed by this towel. This is so compact,but you could use it for anything you need a towel for. I can even see myself using it to clean off my hands while fishing. This is a cool idea.I might even use it as a pillow on our long trip from Florida to the Kentucky Derby later this week. 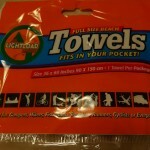 I recently had the opportunity to review Lightload towels. I have a toddler, so my purse and her baby backpack is always full to capacity with “just in case” items. It was very appealing to have something that could absorb toddler messes and not have to carry something heavy to make it happen. We decided to open this one on a day when we were stuck in a waiting room. I needed a diversion and fast. The toddler was successfully diverted. She enjoyed opening the package and kept exclaiming it was a puck until I got it unwrapped, and she saw it became a towel. I am afraid of what she might do the next time she gets a hold of a hockey puck. Here is the towel in stages of unfolding. As you can see, it has a logo printed on it, and it really was crammed into that little piece of plastic. True to advertising, it was absorbent. Had the toddler made some mess, I would have been able to clean it up with this and be pretty content. I don’t know that I would use it on her skin. It is very scratchy, and I am certain she would be angry with me. It does soften up with water added, but it has to touch you for that to happen right? My new use for it will be in my hockey bag. It is imperative to dry your skates after each use, and this towel is going to be fantastic for that purpose. It takes up no space in my bag. The others that I received will go back in the toddler bag for wet emergencies! Thanks so much to Lightload for letting me test these out! Now here is your chance! I always keep small and handy towels and napkins with me while traveling. I was in search of some light and water absorbent towels for a long time and recently I came to know about Lightload Towels– the world’s only towels that are survival tools. Today I am going to discuss my experience with Lightload Towels. 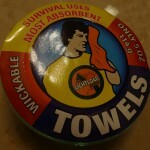 -The Only Towels That Are Survival Tools! 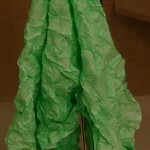 -Wickable Fabric so keeps you from freezing in Cold Activities! -More Absorbent than Cotton and Microfiber! 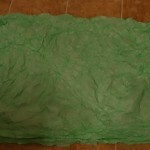 -Waterproof Packaging so Always have a Clean Dry Cloth in the Outdoors! -Ultralight-weight and superior for packing into small spaces! The world renowned Lightload Towels are the only towels that are survival tools. Use them as a towel, wash cloth fire starter, first aid supplement, diaper, insulator, static electricity insulator, mask and more. Each piece packs down to 1.5″ in diameter and 5.75″ in girth and .25″ in. width..They’re great for storing in tight spaces like suitcases and small pouches. They weigh a mere .6oz so you’ll find them helpful where weight is a concern like in travel or backpacking. Waterproof packaging covers each piece. Because of this you’ll always have a clean dry cloth for good hygiene, personal care and first aid. The material is 100 percent viscose and made from cellulose(not oil, like microfiber) acts as a sponge and absorbs up to nine times it’s weight in water. They are also very energy efficient needing little energy to carry, wash and dispose of. Add water to the towel or start wiping water off of you to soften and open easier. They’re very comfortable against the skin and are also great for indoor gyms and spas. In caring for the Lightloads hand washing is best.You can reuse them. They last until they don’t. This three pack is a great gift and is easily mailed. Colors of the towels are assorted.You golfers can freeze to make a cold towel. 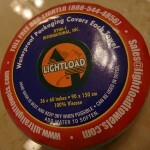 Lightload Towels comes packed in clear plastic case with all the information written over the cardboard. These are available in three sizes– Beach towels 36×60 inch assorted colors three pack 12 x24 inch assorted colors two packs 12 x12 inch assorted colors. I chose three pack 12×24 inch packs. It consists of three towels packed in a plastic wrapper. It has waterproof packaging and is quite light. It can be easily carried around in a bag or pocket. As soon as you unwrap the packaging, you will find a small disc shaped cloth which feels really hard and rough to the touch. You simply need to throw it in a bowl of water and it would open up revealing its full size. I used it as a washcloth to remove face mask or when I do the oil cleansing method. It feels soft and gentle on the skin and removes all oil and mask off the skin without leaving a residue behind. Few days back, I spilled hair oil all over my hands and legs and I simply soaked the towel in a bowl of warm water. I then used it to wipe off the oil and within a minute there was no oil on my skin. It absorbs water quickly and it is a great tool when you travel. I carry it with me everywhere and wipe off my face with it and all I get is fresh and clean skin. The material of the towel is 100 percent viscose and made from cellulose (not oil, like microfiber) acts as a sponge and absorbs up to nine times its weight in water. They are also very energy efficient needing little energy to carry, wash and dispose of. Add water to the towel or start wiping water off of you to soften and open easier. They’re very comfortable against the skin and are also great for indoor gyms and spas. In caring for the Lightloads hand washing is best. It dries up pretty quickly. It acts as a multipurpose tool and can be used as towel, washcloth, mask, fire starter for camping, scarf, first aid insulator etc. It has not been soaked in water! It gets soft after soaking! • Feels soft and gentle on the skin. • A must have if you workout. 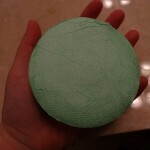 The towel arrives in a packet that is about the size of a hockey puck. This fits in any pocket, making it very useful. Of course, I didn’t leave it in the package for long and opened it up to see what it was like. The compact little vacuum-packed puck pulled apart (add a dribble of water to make this easier) into a big towel that was far thicker than expected. Since I don’t live where there are beaches, I found other uses for it. Namely, it’s an exceedingly absorbent auto shammy. Ya, this probably isn’t what the manufacturer thought of when they made this towel, but even after use, a wash, and more use, this little towel is easy to roll up tightly (when dry) and keep in a nook in the car to use as a chamois for drying and touch-ups. Given that my profession is “automotive journalist” and I often need to touch up the cleanliness of test vehicles in order to take photos, this is a perfect use for me and the Lightload towel fits the role perfectly. Even if you plan on just carrying it in your jacket or pants pocket “just in case” you end up at the beach, it’s still a great little product. Awesome idea that is far more than the gimmick I expected.